This is my second attempt at shooting the Pop Diner on Queens Boulevard, and I’m still not completely happy with the results. I’m trying to achieve a cleaner, crisper look, and it is eluding me. Still, I’m happy enough with this to share it today, and I expect I will revisit the location again. I like the star on the lights and the texture in the concrete/street. Overall I like it. It would be nice if the brightest elements on the diner were toned down just a little bit but other than that I think it’s pretty cool. Love the lights Mark. Looks pretty clean to me! 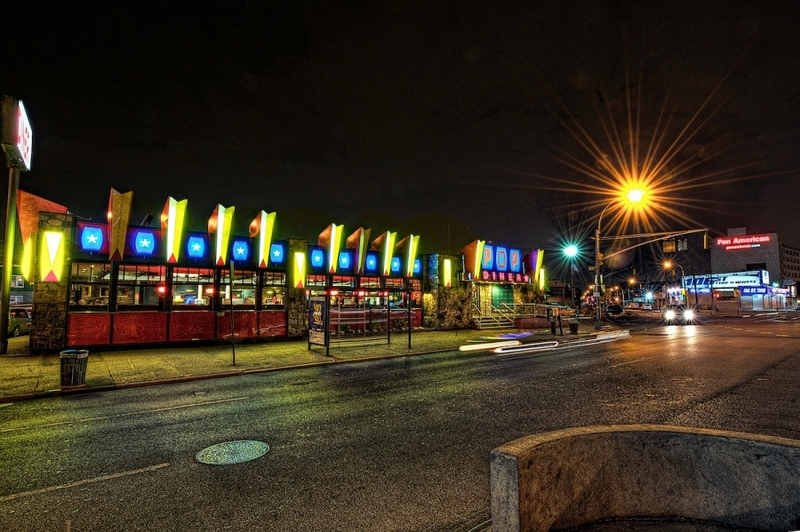 You know, I love that this place is named the Pop Diner – I feel your image looks like pop art, with the bright colors, the flare of the lights, everything put together. I think it’s a great representation! I think James noticed what bugged me. Unfortunately the bright elements weren’t toned down in even the darkest exposures. I think the rain has something to do with it, and I probably should have shot more brackets. I don’t mean to indicate I don’t like the image, so thanks Jim and Preeti for the comments. I do think the diner owners were consciously playing on the pop art concept with their design, and I was trying to capture that spirit as well. Glad you noticed.